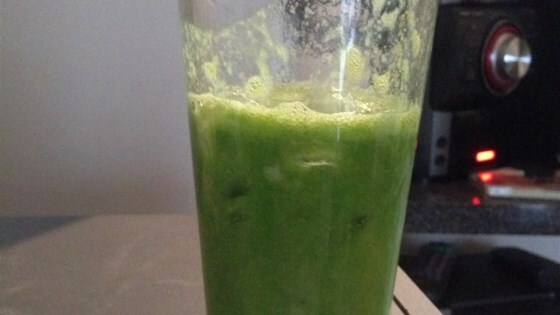 "Great juicer recipe with veggies you won't taste. Great for kids as they don't taste the veggies. My 3- and 5-year-old boys love it!" Process oranges, lemon, green apple, spinach, and kale through a juicer according to manufacturer's recommendations. This is awesome! I actually would add a lot more spinach and kale, because even a cup doesn't make much, and it really doesn't change the taste that much. Either way, great juice! Thanks! Very tasty juice, nice and tart! Good flavor for a green juice! Nice citrus flavor! Try adding a piece of ginger! That ups the zing and takes this great juice to a new level. Can't taste the kale or spinach but I know it's in there. A win-win all the way! !